Welcome to Lecter's Lair! Well, not really; it's just a little Lecter shrine on my website. You can find a more elaborate version of my Photoshop rendering here in the Wallpaper section of the Downloads page. If you don't want to be here, I'm sure Hannibal will carry you back to the main page if you click on him nicely. Whatever you do, don't be rude! If you've decided to stay, please be patient while the animations below finish loading. All good things to those who wait, you know, and I do think these are pretty cool. :^) If you click on them you can download larger versions. Well, I wouldn't go that far, and I'm not one of the hugest Lecter-lovers around, but it is fair to say that the good doctor has a special place in my heart. 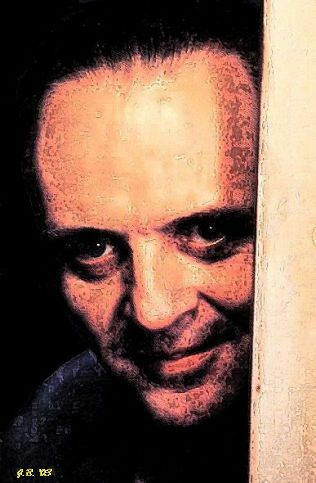 If you've read through my scrapbook of Anthony Hopkins memories, you know that when The Silence of the Lambs was getting its Oscar nods I was having emotional problems and found the very thought of it too disturbing to deal with. But luckily, I did get better and get over my fear of the movie as well. Along the way from there to here I had a number of interesting Lecter dreams. In the first one, from March 1992, I was in an acting class and we students were reading lines for a play. Anthony Hopkins was there was well, masked and in costume as Hannibal, having fun fooling around with us. We made a giggling show of fleeing for the windows from him, then when he came up beside me I asked if he could twist open the window for me, because it was stuck. He managed this with his stronger hands and I slipped out then back in again. He had the restraint mask off now, and I kissed his cheek in thanks, more lingeringly than was appropriate, I'm sure.